A longtime audiophile demonstration disc. Hope will show off your system's dynamic range as well as any record ever released. Hugh Masekela, the outstanding South African trumpeter, assembled a seven-piece group and recorded this great set live at Washington, D.C.'s Blues Alley. The songs stretch over a period of nearly five decades and serve as an informal guided tour of Masekela's life. The songs are honest and bare, and as for the sound – WOW! 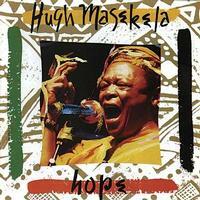 This DSD rendering of Hope is as close as you're going to get to a live musical experience. The musicianship from the assembled lineup is spectacular. The soundstage created places you at the center of it as if you were sitting right there in the club as it was performed. There is no artifice no special effects or gimmicks just music by one of the preeminent trumpet masters of the Afro Beat Jazz movement. The mixing and mastering is superb. I sometimes forgot that this was a live recording only to be reminded by the enthusiastic applause coming from the audience at the end of each track. The music covers close to fifty years of Masekela's career and as always he sings and plays about his life and the people of South Africa. It is a joyous affirmation of his homeland, its people, and his talent. It is without question one of the best recorded live albums I have ever heard in all my years of listening to music. I was thoroughly impressed and you will be too.